Braving the inclement weather a good crowd turned out at the Carl’s Family YMCA this morning for the kick-off breakfast for the 2013 Strong Kids Campaign. The Strong Kids program uses money collected during the campaign to fund scholarships for children who might not otherwise be able to attend the day camps and other events that the Y runs for children. Programs include swimming, a running club for girls, the day camps, a preschool learning program and more. 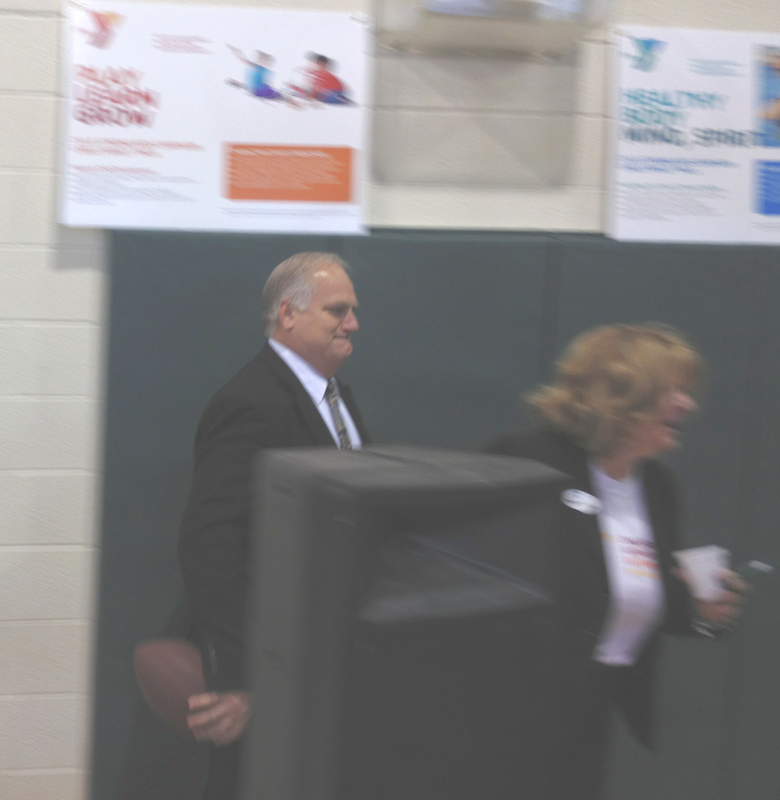 The kick-off breakfast at the Y featured former Lion’s quarterback Eric Hipple as the speaker. Eric delivered an inspiring talk about the impact of the YMCA on his life and on its strong influence on his moral values. His message was about the influence of having connections to loved ones and the community as anchors to good mental health and how programs like Strong Kids help build those connections. The Strong Kids campaign has four phases – a phase for staff giving, a phase for giving by the Y Board, a phase for giving by major donors and a phase for giving by the community. The first three phases were successful and helped raise over half of this year’s goal. Now it’s our turn in the community to support this great program with our giving. The pledge card is shown above as part of the campaign brochure. You may download it for print out by clicking here. I support this cause and urge you to find a few extra dollars to support it too. Strong Kids make for strong adults. 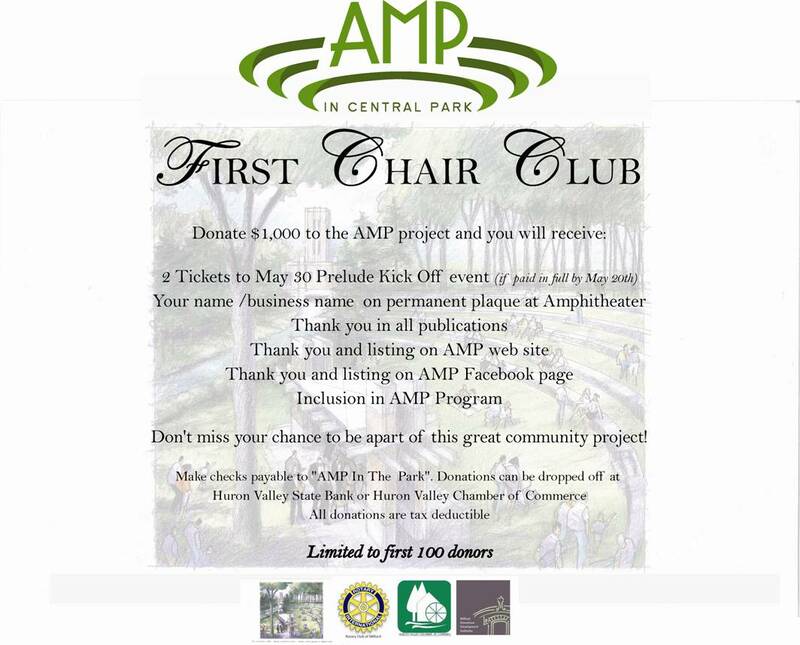 Join the First Chair Club and support this wonderful community project. Many people who live in Milford, Michigan know that there is a project underway right now to raise funds to create a new amphitheater facility in Central Park. The fund-raising for the project is being headed up by a group made up of the Huron Valley Chamber of Commerce (HVCC), the Rotary Club and The Milford Downtown Development Authority (DDA). The Milford Historical Society is also involved through it’s role with the Pettibone Creek Powerhouse, which the Society rescued and restored. The AMP project as it has been named includes the creation of an amphitheater with a permanent stage for events such as the summer Concerts in the Park series and other events. Also included in the project is the construction of permanent bathroom facilities for the park, to replace the Port-a-Potties now used. For more on the design and the overall project click here. One fund raising effort is called the “First Chair Club”. This is a donation program for those able to contribute $1,000 towards the project. Those donars with be special guests at the inaugural event at the new facilities – they will have the “first chairs” at that event, which is scheduled for May 20, if all of the money for the project is collected by then. Click here to see the poster full size. This month’s Featured Business on my Move To Milford Web site is Raven Loon Communications, which is owned and operated by Joan Witte. Joan is a fellow ex-pat of the big corporate world. Like me she had many years working for and with some of the larger companies and organizations in Southeast Michigan; in her case that included time at Ford Motor and the University of Michigan. She was a key player in the marketing and PR organizations of those organizations and was involved with many of the big projects that have had major publicity efforts over the last few decades. Joan has also had major involvement in the planning and execution of the publicity and marketing efforts that accompanied some of SE Michigan’s largest infrastructure projects. Those campaigns of TV ads and newspaper articles and neighborhood information sharing events to explain and soften the impact of major road or bridge closures for rebuilding don’t just happen. People like Joan plan them and make them happen, and she did for some of the biggest projects in this area. Joan is now applying the knowledge and techniques that she developed from those corporate experiences to the world of small to medium businesses and non-profit organizations. Not every company can afford big, expensive ad and PR campaigns for new product launches or major new projects; however no company can afford to go into those types of things blind. Joan helps companies understand the “who, what, when, where, why and how” of what they need to do in marketing and PR in order to be more successful. She can also help with answering the questions “how much to spend, on what and where”, to achieve the maximum return from whatever limited budget is available. Without those insights you might be just as well off to open the front door and toss the money you’re spending on advertising and marketing out on the street in hopes of attracting a crowd. You really don’t know. Joan’s services range from simple sit-down sessions to discuss your business’ current marketing efforts and explore potential new directions; all the way to planning and executing full blown campaigns that combine marketing and public relations efforts in support of a new business or a new brand or the rejuvenation of an existing business/brand. I’ve enjoyed getting to know Joan and understanding her approach to what she does and appreciating her level of professionalism. I can highly recommend her. So, before you let worrying about all of the marketing and public relations issues involved with your business turn you into a raving loon, get help from The Raven Loon. Call Joan for that first sit-down meeting. You’ll be glad you did. The Raven Loon Communications – 248-438-6786. “If everything’s a carnival, there’s no carnival left.” (Victor Hugo), from the Jack’s Winning Words blog. In Jack’s post he explains that Hugo was using the word carnival within the context of the times, which referred to the heavy and often decadent celebrations right before Lent – sort of like what takes place in New Orleans and Rio. I’m sure that Fat Tuesday is often followed by Hangover Wednesday in both places. In the broader context I suppose that if life just one big party to you then there’s nothing special about going to a party. Vacations, for instance, wouldn’t seem so special if we all lived in the sunny, tropical places that we love to visit. Graduations are only special because of the work that it takes to get to that day. Special events and special days in our lives are special because they are out of the ordinary, everyday experiences. We hear occasionally of someone’s life being a “whirlwind”, which may be another way to say a carnival; but, not necessarily in a good way. Usually we hear about someone’s whirlwind lifestyle after something has happened to cut their life short. It is then that we look back on what looked at the time to be such a wonderful life and take pity on the poor soul that was trapped in that whirlwind. How often have we learned after they were gone at relatively young ages how miserable some of the biggest stars of the sports and entertainment world really were? They looked so happy while accepting the accolades or prancing down the red carpets of their whirlwind lives. So, be happy that your life’s not a carnival, because that makes finally getting to the carnival all the more fun. On February 27th the Strong Kids Campaign Kickoff Breakfast is taking place at 7:30 am at the Carls Family YMCA. The guest speaker at this year’s kickoff breakfast is former Detroit Lions quarterback Eric Hipple. This annual breakfast kicks of the fund-raising campaign for the program that the Y runs to make sure that no children or teens are denied the benefits of the programs that the Y runs for them because of a lack of funds. The funds collected are used to provide scholarships to those programs for kids who could not otherwise afford to attend them. With your donation to the Strong Kids Campaign, you make it possible for children and teens to take part in programs that teach them positive behaviors, allow them to explore their talents and help them grow and realize their potential. Thank you for your support and generosity! Click here for a video about the Strong Kids Campaign. 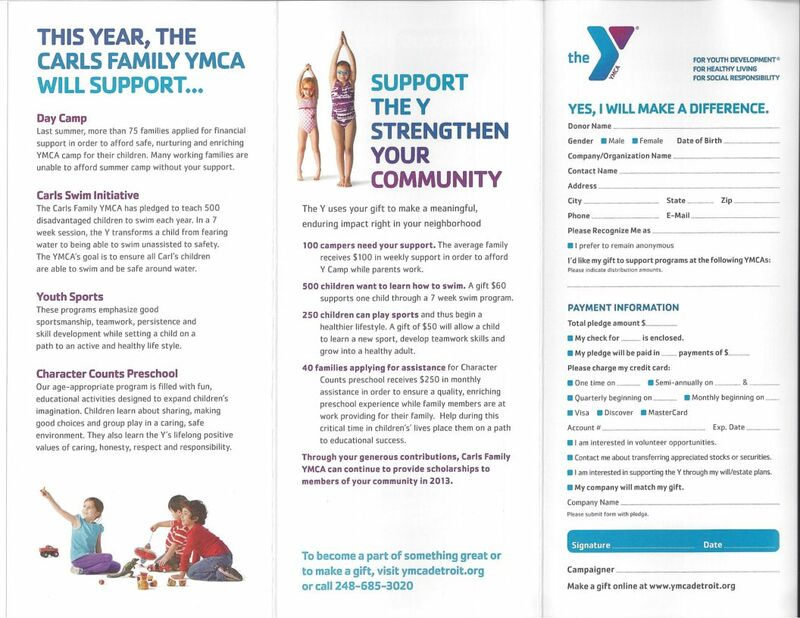 •Carls Family YMCA Day Camp (Camp Huron): Last summer, more than 75 families applied for financial support in order to afford safe, nurturing and enriching YMCA camp for their children. Many working families are unable to afford summer camp without your support. 100 campers need your support. The average family receives $100 in weekly support in order to afford Y Camp while parents work. •Carls Swims Initiative: The Carls Family YMCA has pledged to teach 500 disadvantaged children to swim each year. In a 7 week session, the Y transforms a child from fearing water to being able to swim unassisted to safety. The YMCA’s goal is to ensure all Carl’s children are able to swim and be safe around water. 500 children want to learn how to swim. A gift of $60 supports one child through a 7 week swim program. •Youth Sports: These programs emphasize good sportsmanship, teamwork, persistence and skill development while setting a child on a path to an active and healthy life style. 250 children can participate in sports and thus begin a healthier lifestyle. A gift of $50 will allow a child to learn a new sport, develop teamwork skills and grow into a healthy adult. •Character Counts Preschool: Our age-appropriate program is filled with fun, educational activities designed to expand children’s imagination. Children learn about sharing, making good choices and group play in a caring, safe environment. They also learn the Y’s lifelong positive values of caring, honesty, respect and responsibility. 40 families applying for assistance for Character Counts preschool receives $250 in monthly assistance in order to ensure a quality, enriching preschool experience while family members are at work providing for their family. Help during this critical time in children’s’ lives. 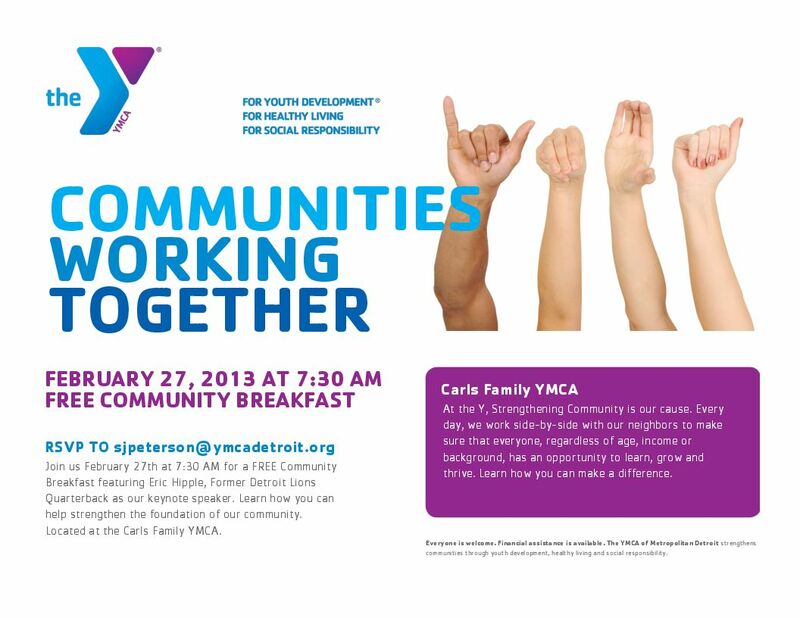 RSVP for the breakfast event by Feb 20 to Sharon Peterson (248)685-3020 or by email sjperterson@ymcadetroit.org. Hurry! You only have one day left to get your reservation in for this event. Whether you use the term imagination or visualization the idea is the same – you first have to be able to “see” what it is that you want – imagine it, visualize it or just hallucinate about it, but see it. That may be the biggest stumbling block to success for many people – the lack of imagination or ability to visualize what it is that they want to achieve. Call it dreaming or call it thinking big, one has to be able to get outside of the box that we put ourselves in and “see” a different tomorrow, a different outcome or even a different person than we are now. One cannot “will” something to be, if one can’t see it. And one certainly can’t go on to creating it if there is no vision to guide the process. 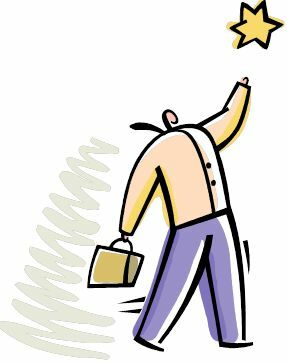 It is oh so much easier to slip into the habit of lamenting the present and wallowing in self-pity at one’s current fate than it is to conjure up the dreams and visions of a better future – to imagine a better outcome and then pursue that alternative. What Robbins and Byrne and other self-help gurus have done is capitalize on the fact that few of us really understand how to go about the visualization thing. We place artificial limitations on our imaginations and box ourselves in with self-doubt and fears (mainly the fear of failing). The real “secret” behind almost all of the self-improvement advice that we see and hear about is unlocking our imagination and helping us understand how to use its power to break out of our boxes. A mind unleashed from fears and doubts and allowed to create new paths for us to take is indeed the beginning of creation. If one then combines the will to act on those newly imagined option, one is well on the way to creating a new future. Shaw put it in a slightly different way in another saying that I like – The people who get on in this world are the people who get up and look for the circumstances they want and if they can’t find them, make them. Imagine that. The single biggest problem in communication is the illusion that it has taken place. – George Bernard Shaw. Shaw was prescient and right on the mark as it applies to modern “communications”, especially email and texting. We seem to harbor the illusion that typing something out in an email or text message and hitting the Send key constitutes communicating. The reliance on those forms of attempted communication, especially in the real estate world, can have unintended and sometime disastrous consequences. One unintended consequence of using electronic means of communications is the fact that words may be interpreted differently than intended and the reader may infer a completely different tone or voice to the words than was intended. How many times have you had to say “that’s not what I meant by that?” My wife also uses the phrase, “you know what I meant.” Well, the fact is that the reader (or listener) doesn’t know what you meant; they just read or listen to the words and apply the meanings to them that they have stored through their education or experiences. At least if one is listening, rather than reading, one can pick up on visual and audible cues. My wife always knows when I’m being sarcastic in a remark; however, a reader might not pick up on that or might infer sarcasm where none was intended. I think one of the biggest mistakes we make when trying to use written communications is not taking the time to completely explain something. We sometimes take mental shortcuts and put them in written communications, assuming that the reader will be able to fill in the blanks or “read between the lines.” That seldom happens exactly the way we intended. Spaces between the lines are oft times filled in with thing we did not mean to say or did not mean for the reader to infer. In my real estate business I do a lot of negotiations back and forth on deals via emails. I also use the phone, but tend to follow up each conversation with an email to summarize what I think we just talked about or agreed to on a phone call. I like to have that email audit trail of what happened in the course of a deal. It is not unusual to have to go back and forth a few times on every issue to get to the point where both sides agree to what was agreed upon. The same is true with text messages, which can become even more arcane with the use of the special language sometimes used in texting. So, if you occasionally (or more than occasionally) catch yourself saying or typing in “what I meant was”, perhaps you need to step back and examine your approach to communicating. Maybe your communication is an illusion and the main person that you’re fooling is yourself. The need to be more precise in your choice of words and use of the language is not just a pedagogic exercise; it is a requirement if you wish to be understood – if you wish to really communicate. My advice is to slow down and think about what it is you are trying to say, either in speech or in writing. You need to think about it from the perspective of the listener/reader and ask yourself, “Is what I’m saying/writing clear enough and complete enough to be understood in the way I intend it to be taken?” After all, if you can’t understand it, once you listen to it/read it; how do you expect anyone else to pull the meaning that you intended out of what you just communicated? Understand? Good, then we’ve communicated. You are currently browsing the NormsMilfordBlog blog archives for February, 2013.